Bonjour lecteurs! Beauty products are très importants for moi. Indeed, we commonly say that it is better to have a shower to help our planet, but I reckon I would be better off having a bath to do my bit. I can easily spend 20 minutes or more in the bathroom… Baba is very coquet too! 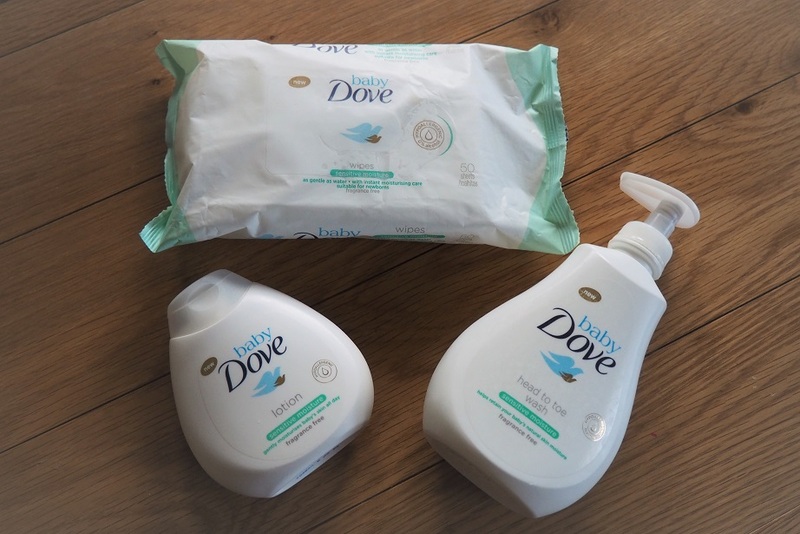 Bien sûr, when we heard that Dove launched a baby range, we had to try it! After all, Frenchie Mummy is a huge fan of the classic Dove beauty bar. 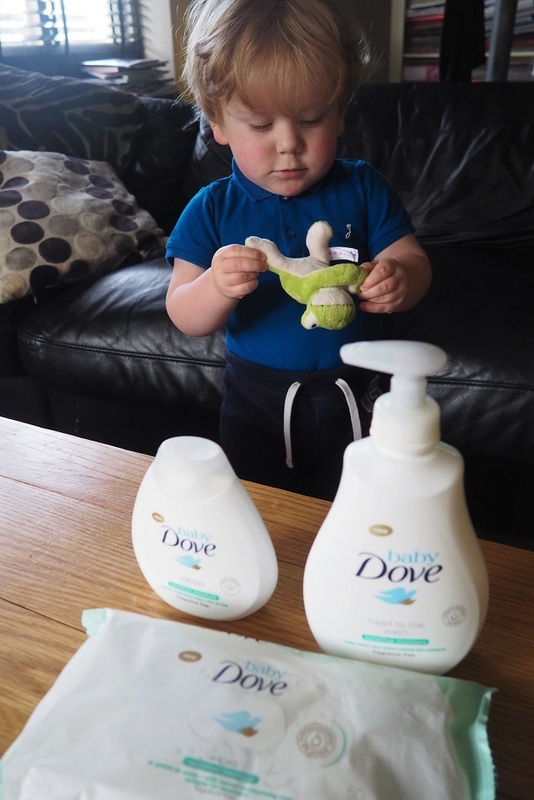 So let’s read now our very own Baby Dove Sensitive Range Review. We tried the whole range and here are our thoughts! Let’s start with les lingettes (wipes). I have always been cautious with those. No doubt wipes are a saviour to parents and can clean anything. Baby Dove wipes are actually very soft and so gentle on Baba’s skin. I really liked the first feel of it. You can see straight away that they are super moisturising. They have such a silky feel and I love that they are hypoallergenic and alcohol-free. They also smell lovely without being too much because they are fragrance-free (nothing worse than a baby product that has an aggressive smell). The second item we received for this review was equally nice. Again, the smell is just parfait on a baby. When they smell nice, all you want to do is kiss them! The texture of this lotion is very soft and quite liquid so that it is facile (easy) to spread all over your baby’s body. Such consistency also means that you don’t need to use much to do it all and it soaks into the skin really well. There is nothing worse than feeling like having oily skin after you use some beauty products – this is something you don’t need to worry about with this product. 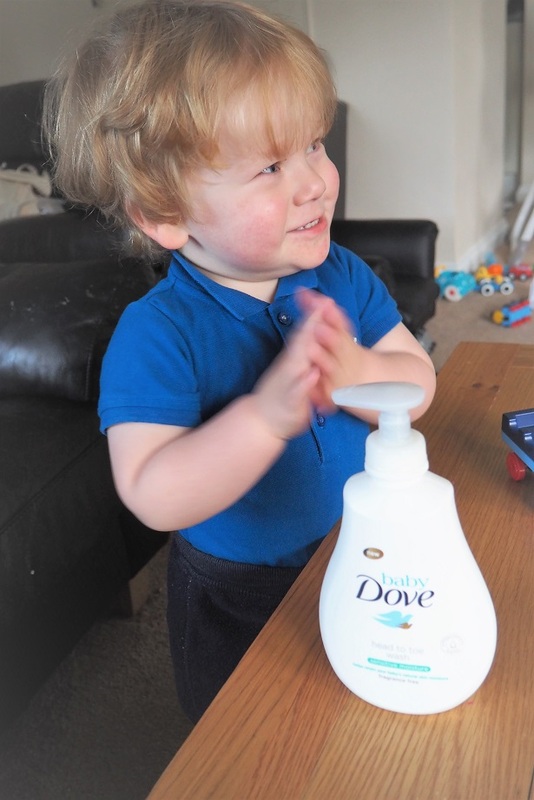 This product from the Baby Dove Sensitive Range has to be my favourite! Its creamy texture is so nice on the skin. I actually tried it myself when I used it on Baba, it seemed too lovely to be ignored! Baba was really excited to try the body wash! It feels gentle on la peau (skin) and even if there is no fragrance, there is a je ne sais quoi about this wash that you can’t resist. Reading carefully the instructions before we started! I wish it could make the bath a bit foamier, but this product does what it says on the label! Baba’s skin feels more moisturised overall! I have always been a fan of Dove – in particular (but not only!) the Dove Go Fresh body washes as they really make me feel relaxed and they leave my skin soft and hydrated. The new Baby Dove Sensitive Range didn’t disappoint us. Fragrance-free so that it is gentle on Baba’s epidermis, it has really improved his skin over the last few days. 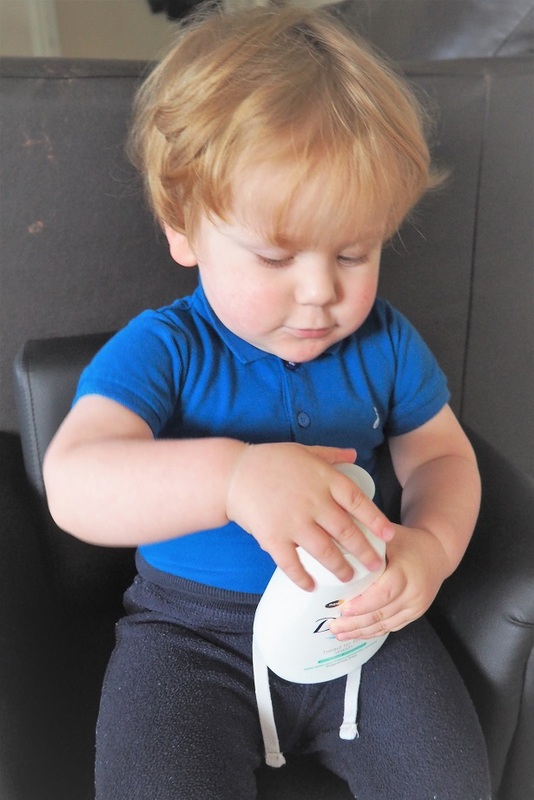 En effet, mon bébé is not prone to have eczema but he can sometimes have a very dry skin on his arms. Well, Dove succeeded as it has much improved and I am hoping that it will carry on over the next weeks. Let’s have a bath now! I am ready for it! Another thing we love about all range? Its smell! I know its texture is fragrance-free but my Baba smells gorgeous! Now for sure, he is a babe! 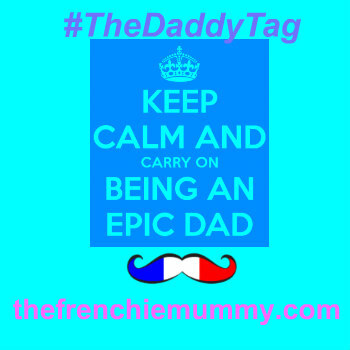 Dove wants to be here to help us on the exciting journey that is parenthood and I say if my baby is clean, fresh and happy, then c’est un succés! 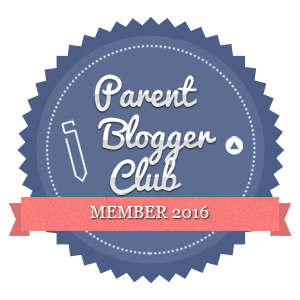 Merci for reading our Baby Dove Sensitive Range Review. I hope I put you in the mood for a long and relaxing bath! Disclosure: This is a sponsored post with Dove. I love Dove, had no idea that they did baby products ! I’m out of the baby stage but my little sister is going to have her first one soon, think I will get some dove items , as it is definitely a good brand ,having used it for years! 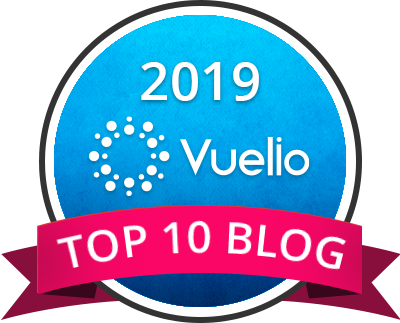 Thanks so much ! I would love to try this range with my kids. It looks great. I didn’t realise Dove did a baby range. Good overview! You can always count on Dove to create products to rely on. They’re especially great for those of us with sensitive skin! Those products sound wonderful. I too adore Dove for myself and I think I will need to find some of this range tomorrow to try for myself!